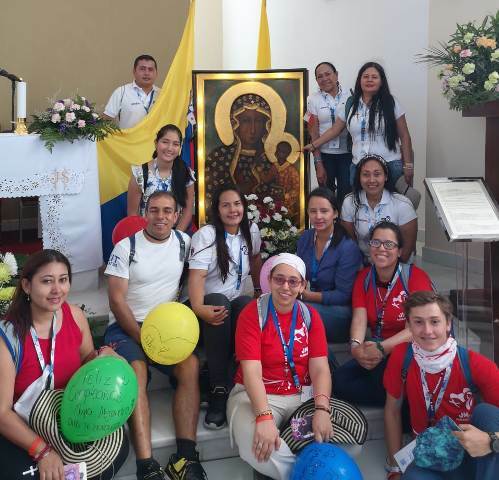 Panama received thousands of pilgrims for the World Youth Day and among them a group of young people from the Diocese of Arauca Colombia accompanied by Fr. Fabio Celi. 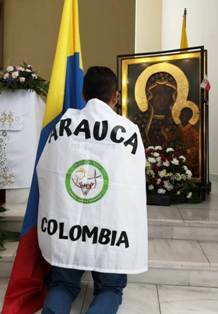 In September 2017, Lech Kowalewski, member of the International Committee from Ocean to Ocean, visited Arauca to promote the visit of the Icon to those lands. He travel to see the place where the Diocesan Marian Sanctuary of La Negrita del Piedemonte y la Sabana is built. A Sanctuary built around the image of Our Lady of Czestochowa. Father Fabio, knowing that the Pilgrim Icon is in Panama, saw the opportunity to greet the Mother of God, and went to the Chapel of St. John Paul II in the area of ​​Albrook, where he was able to concelebrate Mass with two other priests and a Bishop from Argentina. "When we arrived at the Chapel we found ourselves with an illuminated face of someone who until recently was unknown, and it was the face of Mary in the advocation of Our Lady of Czestochowa. I could see in young people an identification with this image, even though it is unknown and with a face that is not very striking for many, I perceived in young people the joy of being there, of feeling identified", said Father Fabio. 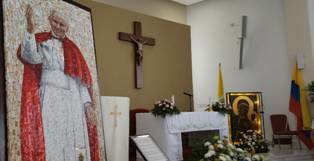 In addition, it was a great surprise for them to observe some relics of Saint John Paul II, right next to Mary, since She is in this presentation the Patron and Queen of her land, Poland.